Selecting the deck design that coordinates with the exterior of your home is perhaps the most important aspect of customizing your deck. 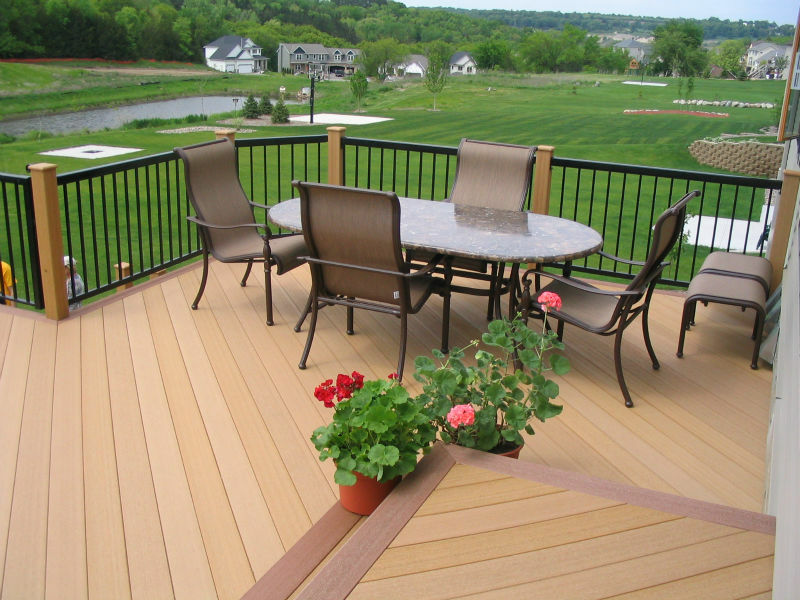 Choosing a stain color for your deck extends from choosing a proper refinishing to selecting a transparency. It will serve you to be mindful of how often you plan on refinishing your deck. Colored stains are often difficult to be removed, so more than likely once you make that change you’ll be stuck with it for a while. Colored stains also quickly become aged quicker than they should. Typically, when choosing a color, you’ll want to coordinate the color with the siding of your home. Try going to a paint store to find a chip that matches a color of your siding so you get a good idea of how it will look on your deck. Selecting a transparency will help display the natural color and grain of the wood. Patio furniture is another aspect of your design that you should consider. Take into consideration the furniture you already have for your patio when choosing a new color. Another great suggestion is to take colors from your backyard to make each of the colors tie in with at least one aspect of your home’s exterior. When actually taking the steps to redo your deck design, be mindful that you have the tools available to do the job correctly. The most important tools you’ll need to make sure that you have include a deck brush and a deck sprayer. You’ll also need an old rod or a stick to act as a stirrer. With the right tools at your disposal, you’ll have everything you need for a do-it-yourself design remodel. If you do choose to do it yourself, ensure that you don’t over-paint or under-paint the deck doing either of which will leave the deck with a relatively poor appearance. For the perfect look that you desire, you’ll need to consider the basic fundamentals of painting. A high volume of contractors think the more coatings you give the deck, the better it will appear which is contrary to the truth. Once you’ve settled on the color you’d like your new deck to be, it’s time to decide whether or not you’d like to take the project on yourself or if you’d like to hire a contractor. In Colorado Springs, O’leary and Sons is more than capable of providing you with the deck design colorado springs that you’ve always envisioned. After serving Colorado Springs homeowners ever since 1988, we have a strong body of work of decks we have remodeled for satisfied customers across the area. If you’re considering hiring a Colorado Springs contractor to perform your brand-new deck design, visit our website to view the many different deck’s we’ve created for happy customers. Yours could be next!